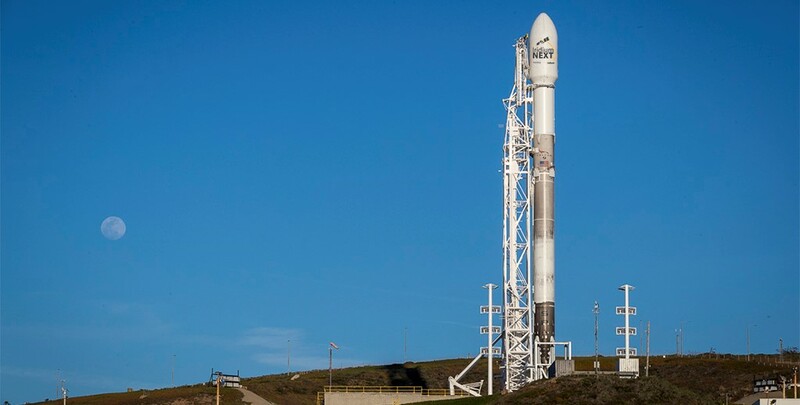 MCLEAN, Va. – April 9, 2018 – Iridium Communications Inc. (NASDAQ: IRDM) announced today that the Iridium-6/GRACE-FO rideshare mission, the sixth Iridium® NEXT launch overall, has been targeted for launch by SpaceX from Vandenberg Air Force Base (VAFB) in California for May 19, 2018 at approximately 1:03 PM PDT (20:03 UTC). An exact instantaneous launch window time will be available closer to launch. The second of four Iridium launches planned for 2018, this mission will deliver five Iridium NEXT satellites to orbit, alongside the twin satellites for the NASA/German Research Center for Geosciences (GFZ) Gravity Recovery and Climate Experiment Follow-On (GRACE-FO) mission. Collaboratively chosen by all parties and considering range availability, this launch date maintains scheduled completion of the Iridium NEXT manifest in 2018.
already onsite at the VAFB Harris Corporation facility, and have been stacked, attached to their dispenser and are preparing for transfer to the SpaceX launch complex.